The first time I learned I was carrying twins, I raced out of the medical lab where I’d had the ultrasound, and headed down the block,straight for my fitness class, exploded through the door, threw up my armsand yelled “It’s twins! It’s twins!” to a stunned classroom of gyrating females;ran back to my old Datsun and beat it for home as fast as I could totell my husband. Half way there I looked up, yelled “Thanks God!” andstarted to cry.When I got home I raced into my startled husband’s arms andblubbered, “There’s two! There’s two!”I think we danced around a bit then phoned our moms. Guessyou might say we were excited. After we’d had a boy and girl to join our three-year-old first-bornson, many people said;“There. Now you’re finished.”For a while we thought we were. Heaven knows those first months were not easy, but after a year or two, things seemed – well – not hectic enough. We were both from families of four children after all, so we thought we’d even things up and try again.What our doctor didn’t tell us was that if the mom happens to be over the age of thirty-five when this occurs, that the odds of having more than one at a time are considerably different. We learned – once we were pregnant – that those odds could be as high as fifty-fifty.Perhaps it was not so odd then, that we did not even things at all. When we were told for the second time “there’s two, there’s two” excitement was replaced with amusement.What the heck. At least there weren’t three in there.So. You usually have a choice. You can laugh, or you can cry, and since crying is really no fun at all we chose laughter. We’ve laughed a lot since. And cried.Having two sets of twins – five children in six years – can do that to you. One moment tears of frustration and the next, unexpected giggles. Once we had become accustomed to the fact that we’d be getting a double dose of ‘double your pleasure double your fun’, we began to tackle the extras that came with it.First, we bought a new vehicle that was double the size of our car,which multiplied car payments by two.We already had a lot of the necessary tools: a double stroller, two small beds, car seats…. Some small premonition had kept me from getting rid of at least half of it long before.Naming the new babies was another consideration. The older three decided it had to be Bert and Ernie. Our parents offered Pete and Repeat.Friends suggested that if it turned out to be triplets, to call them Eenie, Meenie and Mienie (‘cause you don’t want no Mo). We noticed an interesting change in neighbors and acquaintances at this time. Those who had once said:“There, now you’re finished,” now asked hesitantly: “Um, are you going to continue?”After five we had seemingly entered the realm of the unusual and improbable. 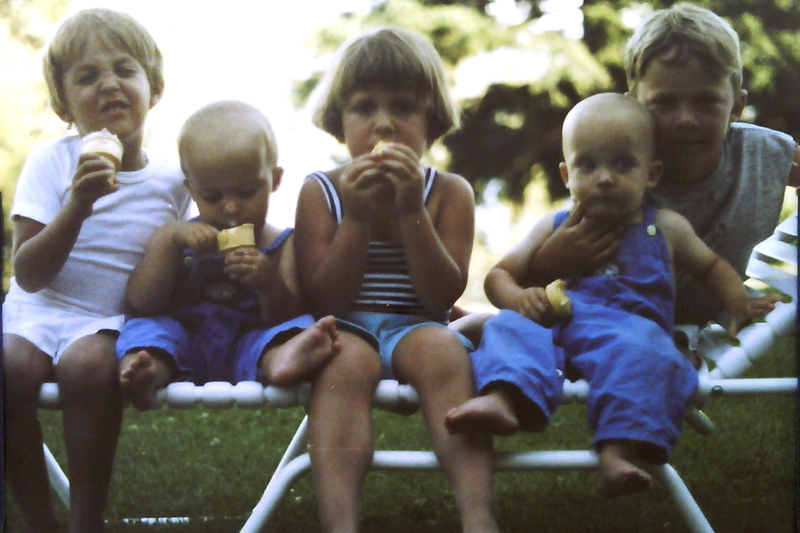 Anyone who could have five could just as believably go for ten, I suppose.When our two wee boys arrived, followed a couple of years later by their sister, the realm of the unusual and improbable descended upon us.Ordinary outings became a study in logistics.Take grocery shopping. You need two carts: one with babies stuffed in and hanging from, and the other with food in it. The hazards are not problems in steering, but rather problems with braking fast to avoid shoppers who stop dead in front of you and just stare.I suppose one does that when seeing double. Your elated response to the first news of twins makes you a candidate for Mom of the Year. So many might respond with feelings of fear or inadequacy. And I couldn’t agree more – we get to choose our response, and your response of happy acceptance has made all the difference in your amazing family. You get my nomination for Mom of the Decade! I remember those days foundly, what a wonderful family.